Brand new to Horseware Australia this season! The new Amigo Hero 6 range utilises Air Conditioned Yarn (ACY) which is a major improvement in yarn technology. The process involves the fabric being air blown which gives a tighter weave using less yarn and results in an incredibly durable, ultra breathable and super lightweight 0g fill rug. 100g breathable liner to attach to selected Rambo, Rhino and Amigo Bravo 12 rugs. Shine-enhancing polyester outer and lining, single front strap with no surcingles. THE HORSEWARE LINER SYSTEM IS CONVENIENT AND EASY TO USE. 200g breathable liner to attach to selected Rambo, Rhino and Amigo Bravo 12 rugs. Shine-enhancing polyester outer and lining, single front strap with no surcingles. 300g breathable liner to attach to selected Rambo, Rhino and Amigo Bravo 12 rugs. Shine-enhancing polyester outer and lining, single front strap with no surcingles. The Rambo Rhino Plus Lite is a fantastic versatile rug in a beautiful Charcoal with Light Purple Check pattern and Light Purple/Charcoal trim, with no fill. Barrier technology means the fully waterproof & breathable layer sits underneath the super strong 1000d polypropylene outer. Rhino Plus Lite also comes with anti-static, anti-bacterial lining with added benefit of being shine-enhancing! Lots of features included; Surefit Neck design with V-Front closure to give freedom to graze and wither relief, Leg Arches for freedom of movement, detachable neck rug, reflective strips, liner loops so you can add whatever warmth you need using Horseware Liners in 100g, 200g, 300g or 400g, available separately. Designed for and unique to Australia & New Zealand, the Rambo Wallaby just keeps getting better! 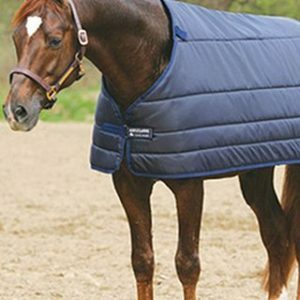 Wallaby Turnout with VFront closure, no fill detachable neck cover, 50g fill in rug, liner system to add liner of your choice. Colour Silver with navy, grey trim. Designed for and unique to Australia & New Zealand, the Rambo Wallaby Duo just keeps getting better! With Australian conditions in mind, versatile in its use and packed with features – it’s worthy of Rambo’s mission – the best your horse can get. The Rambo Wallaby Duo Turnout encompasses patented Rambo features like V-Front Closures to provide freedom to graze and wither relief, SureFit Neck Design for comfort and fit, Front and Hind Leg Arches for freedom of movement for the horse. It also features a detachable neck rug, a detachable 200g liner that is machine washable, stainless steel hardware, triple removable surcingles (2 cross, 1 straight), wipe clean bungee tail cord, reflective strips and large tail flap. The rug itself is lined with shine-enhancing anti-bacterial and anti-static fully breathable nylon lining, as is the 200g liner. The best thing is it now has a brand new fabric for the outer! Utilising a complicated weave pattern to create our new outstanding Twill outer, which has more yarns per square inch than standard weave, has meant we have a significantly stronger rug (up to 45% stronger!). The irregular pattern of threads also contributes to increasing the rip stop ability and tear strength. It is still fully waterproof, and yes it’s breathable! Tested in Australia, UK and Ireland, it has shown great ability to cope with temperature and weather fluctuations. 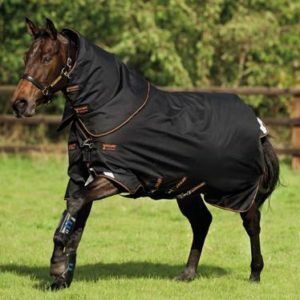 While it’s being all tough and hardy, it also has a soft and luxurious feel, so it is still incredibly comfortable for your horse to wear. The old favourite back with a new front! Our top selling Amigo turnout, the Amigo Bravo Plus Medium has benefited this year from the new Disc Front Closure system! Lighter weight on the front of the horse, no pressure points, wither relief fit and easy open/close from the side. The Amigo Bravo Plus Medium is otherwise the same as ever with its tough 1200d polyester waterproof and breathable outer, anti-static and anti-bacterial lining with 250g fibrefill for winter warmth. Extra features such as front leg arches to give the horse freedom to move, reflective strips, cross surcingles, fillet strap, shine enhancing lining and liner loops to add your choice of liner for additional warmth when needed – Check out Horseware Liners in 100g up to 400g! Detachable neck rug is included with 150g fill.